I’m super excited to share my quilt with you here at the Bloggers' Quilt Festival. My festival quilt marks a huge turning point for me and my quilting. Last year I finally discovered all you talented, enthusiastic quilters in blogland. A little late arriving, but so glad I finally made it to the party. 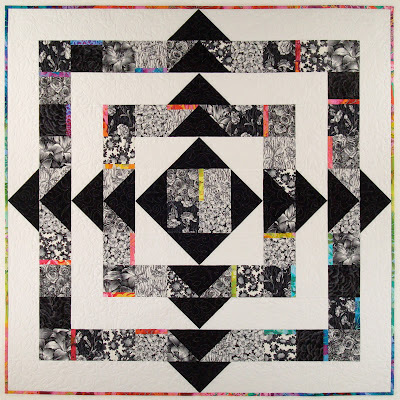 A quilter for 15 plus years, I’ve never quite felt the connection to other quilters that I feel now as I discover more and more of your inspiring blogs. I’ve been more excited and inspired than I’ve been in years. So this year, I decided to join you and play along. 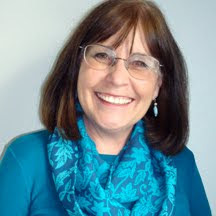 My hat's off to Amy for creating this great online event. 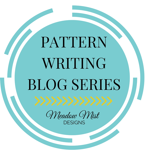 Bloggers' Festival marks the introduction to my newbie blog and my very own quilt business, SpringLeaf Studios. 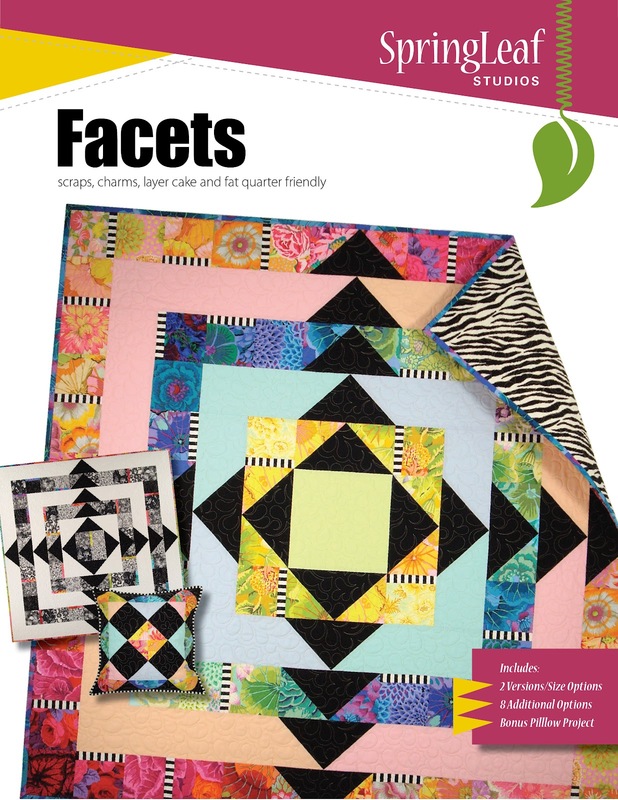 And my festival quilt, Facets, is the very first of my pdf patterns to be released for sale. I have to tell you, it’s super exciting and scary all at the same time. I hope you like my quilt as much as I like looking at all of yours. I’m a designer at heart and by training, so when I design a new quilt, I’m always exploring all the hidden potential within that design. There’s always more than one way to do something and I love looking at all the options. 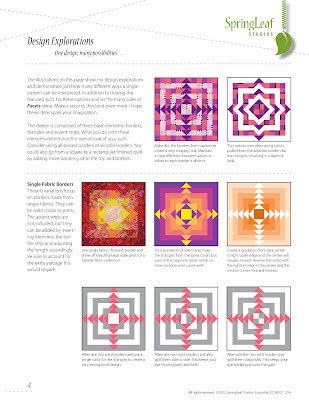 Simple changes to colors, fabrics and placement can make significant changes to the look of a quilt. 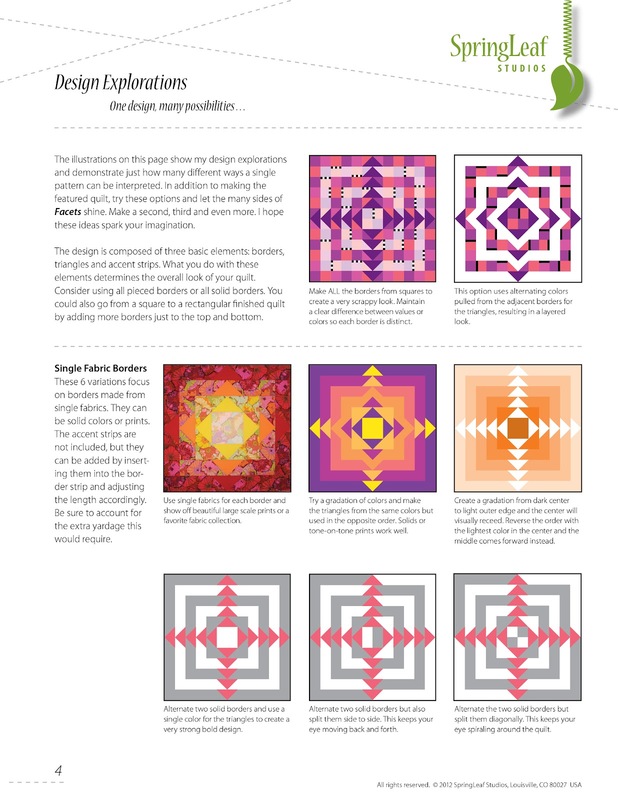 One of the goals with my patterns is to share my process and explorations with you so that you can envision more possibilities beyond the featured design. 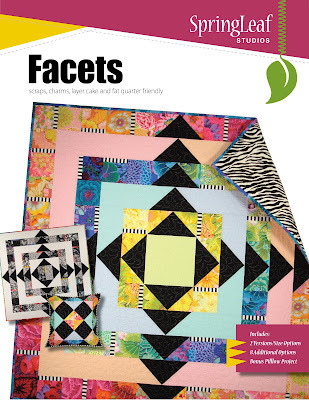 The Facets pattern comes with 2 versions, optional sizes, plus 8 additional ideas and a bonus pillow project that's made from the trimmed leftovers. It’s like getting one pattern with endless possibilities. Pattern is available at Craftsy and will soon be available through my Etsy shop. Check it out. Here's a final shot of both quilts. Don't you just love that striped chair? My talented daughter, Emily, redid it last summer for her apartment. Love it! I LOVE spring! I'm a color person and after a long winter of drab colors, I'm so so ready for spring. Green is my favorite color. All the new little leaves emerging always feels so fresh and clean to me. And then there's the flowers and all their fabulous colors . . . I can never have enough flowers. I'm such a sucker for picking up yet another little pot of something to bring home and plant in the garden. I can spend hours at the greenhouse trying to decide which colors to plant for the summer. Kind of like hours in the quilt shop drooling over all the fabric. I'm almost as bad buying flowers as I am buying fabric. I guess that's why I have so many floral fabrics in my stash. Sometimes I think gardening with fabric is easier than in real life. No watering everyday. Once you "plant" some florals in a quilt, they stay as bright and fresh as ever. And you don't have to weed. Gotta love that! Every spring, I bring the garden indoors by putting up some of my floral quilts and my floral ceramics collection. It makes the room feel new and fresh. This is the quilt that takes center stage. I started it in a class taught by Sandy Bonsib a few years ago. It's made entirely from my floral stash. While the fabrics are pretty traditional and not what I buy these days, I never tire looking at all the individual prints and colors. I think that's the beauty of scrappy quilts. They offer so much eye candy. Every time you look at a scrappy quilt you can see something new. And these are some of the floral ceramics I've picked up here and there mostly at flea markets. I love getting all these colorful floral quilts and dishes out every spring. 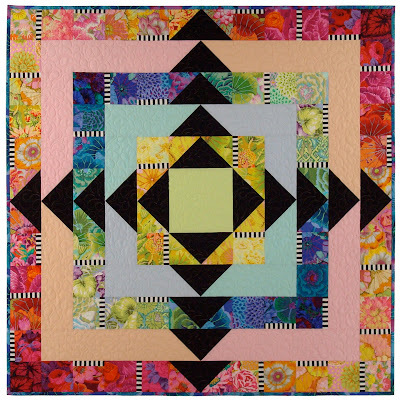 Hope spring is renewing your quilting passion and making you happy.